Imagine the British prime minister calling into question the professional integrity of the Metropolitan Police. Better still, consider what the fallout would be if the comments were made in defence of a gang of people who had engaged in rioting, road blocking, causing millions in damage to the economy and injuring more than 100 police officers in the process. Unthinkable, isn’t it? Now welcome to Northern Ireland where this week First Minister Peter Robinson told Matt Baggott that he must regain the confidence of the “unionist community” who feel they are being “treated unfairly”. And for unionist community please read loyalist flag protesters. Loyalists feel they are being treated differently from their nationalist neighbours which in some ways is true. This is because it is loyalists who after three months of mayhem are now being subjected to the legal consequences. Loyalist flag protesters are being arrested because it is loyalists who have been breaking the law since the start of December. The lawful section of society, the majority who are in danger of losing their jobs, businesses and possibly homes because of thugs draped in a flag think the PSNI haven’t been tough enough. Far from thinking that the flag protesters are being mistreated most people believe up until the last week they have been treated with kid gloves. The first minister has missed a golden opportunity to show leadership. He is drastically out of touch with the vast majority and rather than be progressive has pandered to the lowest common denominator. Among those arrested and apparently hard done by is Jim Dowson, a former fundraiser for the far-right British National Party and now administration manager of the splinter group Britain First. Despite the myth that loyalists are not being granted bail, he was released by a magistrate. Also granted bail was a Carrickfergus man who allegedly posed as a member of the media to get up close to officers and abuse them in the course of their duty. Willie Frazer told a magistrate he didn’t want to apply for High Court bail because he preferred the company of the “crooks” in prison to the ones in government. Granted, young Jamie Bryson - whose hunger strike lasted about as long as a pound shop battery and who taunted police on Facebook while ‘on the run’ - wasn’t granted bail. But then Mr Bryson told his band of hapless followers not to apply for bail once arrested even though he did just that, with his mummy promising he’d be a good boy. This is the same Mr Bryson who believes the UVF is the “people’s army’’ and not a bunch of terrorists, despite it murdering more than 600 people - many of them members of its own community. The 23-year-old, who lives in an affluent seaside suburb full of tree-lined streets and detached homes, travelled to a volatile interface each weekend to preach about loyalist deprivation and discrimination before making his way home to Donaghadee where the whirr of an overhead police helicopter is never heard. The Patten report, which was a key aspect of the peace process, was supposed to hail a new era in policing - not that you would know it. Politicians from both sides, 13 and a half years on, are still screaming ‘political policing’, despite consistently interfering in due process which is in fact the very definition of that overused phrase. 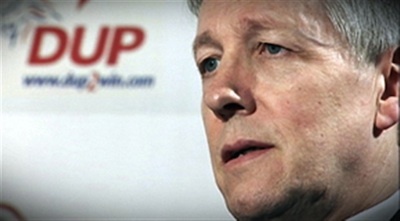 Peter Robinson says a “large section of our community” does not believe the PSNI is being impartial. “Our job is to express the concerns as we hear them in the community,” he said. I would question the use of the phrase “large section of our community”. If unionist politicians had spoken out in December and told the ‘small section’ of lawbreakers to desist in no uncertain terms rather than - as several DUP councillors did - stand blocking roads with them, then those now aggrieved protesters wouldn’t be facing the wrath of the criminal justice system. The trouble of the past three months could have ended much sooner with far fewer arrests had unionism stepped up to the plate and reassured the loyalist community rather than feeding into their fears and hysteria. Unfortunately political innovation is in short supply as politicians have instead blown the cobwebs of the outdated rhetoric of the past and recycled it for 2013. Like I said, welcome to Northern Ireland.